Williams, the third oldest Formula 1 team, and which has the youngest and most inexperienced driver lineup on the grid this season, is facing a tough fight in 2018. Canadian Lance Stroll, 19, is back for his second season with the team and in Formula 1, and he is joined by Russian rookie Sergey Sirotkin, 22. Another new and young addition to the team is a baby boy born last October. His mother, Williams deputy team principal Claire Williams, is now back running the team following her maternity leave. Stroll earned a podium finish for Williams with his second place in the Azerbaijan Grand Prix last year, but that was the only podium visit in a less than stellar season for the team. Williams finished fifth in the 2017 constructors' championship as it did in 2016 albeit with fewer points last year. That's a big drop from third place in 2015. So what are the team's goals for 2018? "Our goal is never to maintain fifth in the championship, our goal is to win," Williams states. "It is to make progress too." Williams last won a grand prix in 2012. "We weren't happy with fifth place last year as anyone would imagine,' Williams adds. "Force India did a fantastic job and we are really hoping we'd get fourth, but they did a much better job than us. We have a lot of exciting things happening in our team at the moment, not at least with (chief technical officer who moved over from Mercedes) Paddy Lowe's involvement in our team. He didn't or couldn't have much of an impact on the team's car last year as he joined at the start of the season when the car was already done." Indeed, Lowe and the designers and engineers opted for a new concept for the car created by the team founded by Frank Williams and Patrick Head. "The car has many new features, most of which are not all that obvious," Lowe points out, "but externally the team has pursued a very different aerodynamic concept which has allowed us some significant progress in aerodynamic performance. All Formula 1 cars are an evolution of what has gone before to some extent, but the FW41 does involve a number of departures from the directions that have been pursued in the past. Overall, the philosophy we are starting to see emerge is a new approach to the collaboration between aerodynamics and design to achieve the optimum working result." Williams firmly defends the team's decision to go with its young drivers. "We had a number of drivers on our list as you would expect," she points out, "and as everybody knows in Abu Dhabi we did an extensive evaluation, probably the most exhaustive we've ever done when it comes to considering our driver line-up. Of course, there were a number of drivers being considered, but I don't want to go into the details of who and how and why we came to the decision that we did." As has been well documented, Robert Kubica was in the running for a race seat at Williams until Sirotkin edged him out at the test after the season-ending Abu Dhabi Grand Prix. Kubica is now the test driver and his input will be invaluable. "Since his accident he's worked so hard in order to comeback," Williams says. "Just the very fact that he's able to comeback in the way that he has really impressed everybody, not least us. He's got a really important role this year with the team. With two young drivers having someone with Robert's experience is going to be critical for us, but we are focused on this year with our two race drivers in Lance and Sergey. In terms of 2019 and the situation that might evolve this year we will just wait and see." Kubica is solidly on the record that his job is not turn fast laps, but to make the car faster for Stroll and Sirotkin. 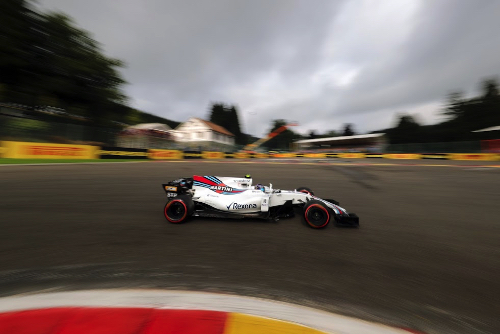 "The role I now have in Williams is interesting," Kubica says. "I discovered here that I'm enjoying more than I was thinking. I had some doubts, thought it would be difficult in the beginning, but I think and hope the team see that I'm 100 percent committed. "Like this I can give a wider support and it was fundamental also to test the car because, like this, I have a global picture of what's going on and can provide better feedback and also some ideas that I think will make the car work better." And the 2018 Williams FW41 is going to have to work better if the team wants to move up in the constructor standings. "It is going to be tough with more challenges out there," Williams acknowledges. "Force India, McLaren with their Renault engine, plus Renault are looking strong. It will be difficult but we have to make progress, and that is what we are always fighting for at Williams every single day."